Our Choice for Stunning Bridesmaid Jewelry! In every wedding, the bride is always the centre of attention. The groom and his crew can always make a stunning show, but nothing ever beats the bride and her beautiful flow of colourful gowns and girls. As the bride, you surely have everything planned out for your big day, from the type of dress to the colour and nature of jewellery, but have you made plans for your bridesmaids? The women that make up your bridal team are extremely important and play a huge role in giving you the wedding of your dreams, but of all these women who surround the bride at a wedding, the most important of them all are the bridesmaids. This position is so important, and not just any female can take it up at a wedding. It is reserved for really close sisters or best friends of the bride. 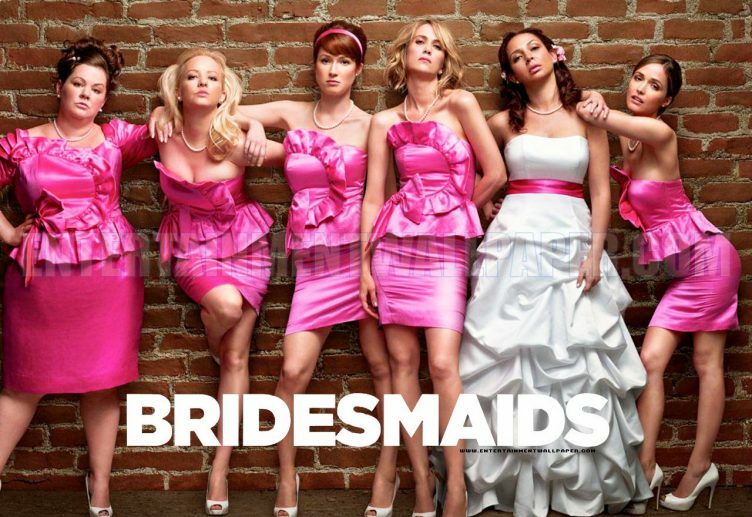 Most girls already know their bridesmaids, years before they meet their groom, and it is just a way of telling the friends how important they are to be chosen for that enviable position. 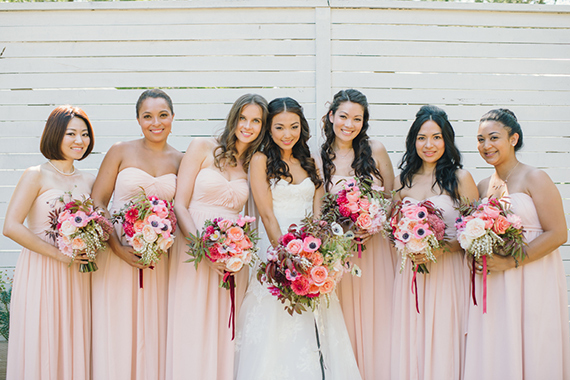 Apart from the bond of friendship which influences the bridesmaid vetting, there is also this myth that says a woman who is a bridesmaid at a wedding will find her own husband very soon, so brides choose them also based on the friends they feel need the good luck that comes from the position to get a good man of their own. Needless to say, this position is extremely important, so what accessories should your bridesmaids wear at your wedding? For those who only think about the dress, you should know it is just the beginning. 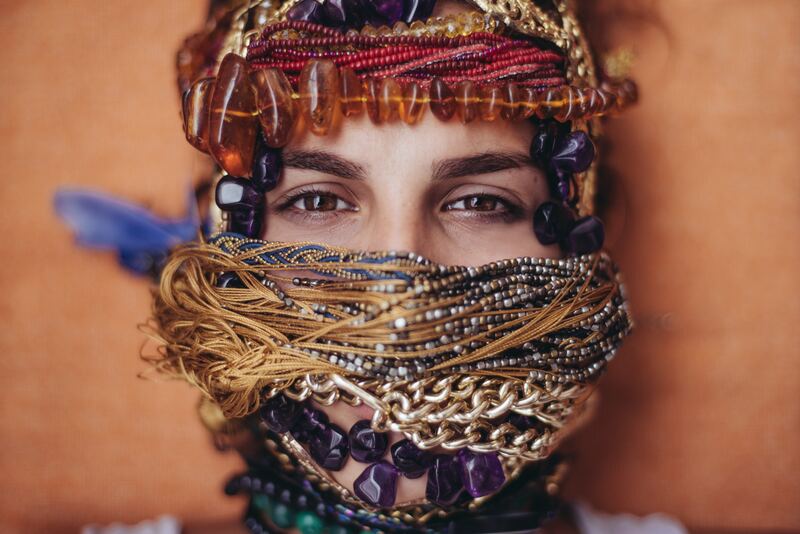 Once you cross that hurdle, the next and equally important stage is the jewellery of your girls. Whatever they wear has to complement your own garment and jewelry. Remember that everything revolves around the bride and no member of the bridal train should look better than the Queen of the occasion. They all should look stunning, but let no one steal your shine, so all their accessories must be a complement to your own. Now, you are probably wondering how to go about making your bridal train look stunning without stealing your show at the same time. It is easy, and we are going to help. 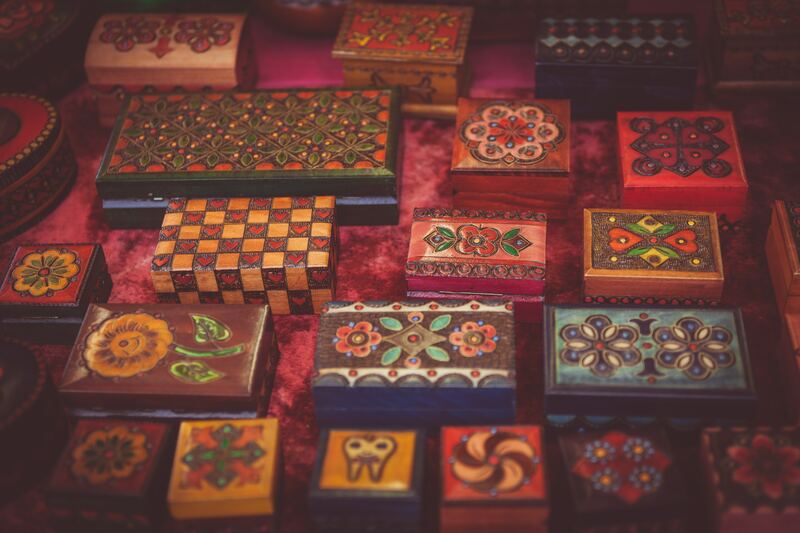 Since everything is about you and what you like, you cannot talk about a choice of jewellery for your bridesmaids when you have not sorted out your own. Yours is like the hinge from which theirs will come from, so let us break it into steps. Know what you want to wear and fix your mind on it, then you can let your bridesmaids follow the same style you have chosen. If you pick white gold for example, your bridesmaid can wear similar jewelry with lesser size of diamond. This way, you remain the Queen while they also look stunning. But if you don’t know what you want, they can’t make a move on their own jewellery. Let them make their own choices and ask for their opinions. 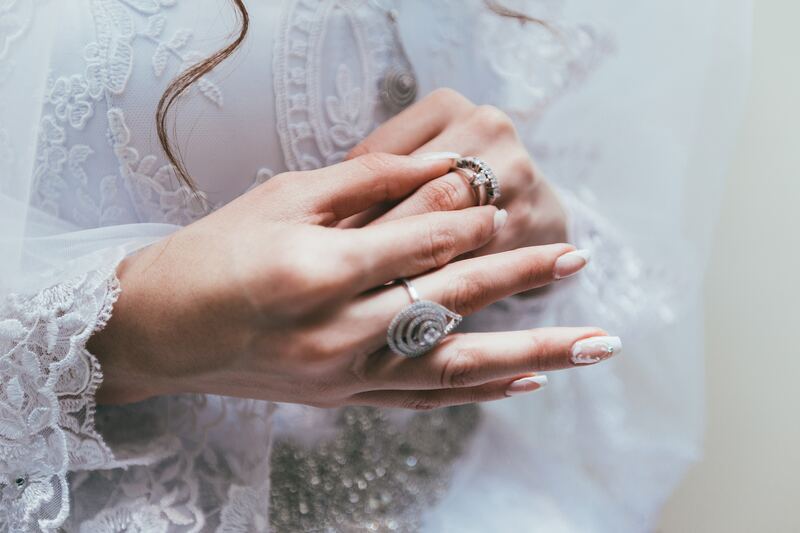 After you have chosen a type of jewelry for your big day you need to allow your bridal train know what you have chosen and leave them to take it up from there. If you have picked the right set of people, they already know they should not do so much to the point of stealing your show. This is why you should pick stylish beautiful ladies who know how to look good. Don’t let them all appear the same way with respect to jewelry, especially if they already have the same type and color of dress, it will look too uniform and somehow boring. So just let them know what you are wearing, give them guidelines, and let them make their choices. The ones you will see on this list should be the first suggestion you hand over to them when making plan for your wedding. Though they are just bridesmaid jewelry, you will also get tips on what to wear as the bride. Do not overdo it. It is possible to get so carried away with the excitement of your wedding that you get really worked up and ruin the day by requesting too much accessories. Just like makeup, jewelleries don’t need to be too much before you can make a statement, and this rule works for your bridesmaids as well. If you are confused about how possible it is for you to overdo jewelry at your own wedding, just look at the dresses and makeup you have planned out for you and the women who make up your bridal train, if they all are too flashy, you will not look graceful and there will be too much activity going on in one person alone, and it will be worse as a group. 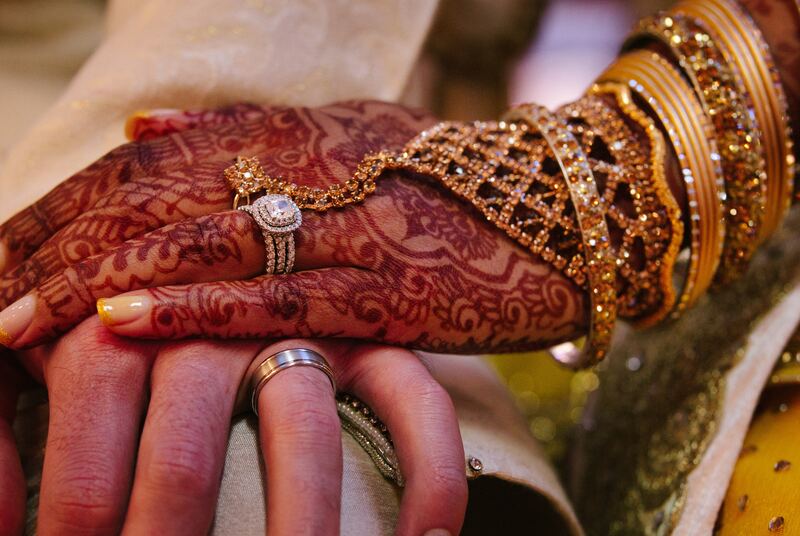 So this is what to do, look at what you are already set to wear and if it has a lot of diamond stones for example, you may want to reduce it in form of jewelry, both for you and your bridal train. You still want people to notice your pretty face despite all the accessories, don’t you? Too much sparkle will make it hard for them to see your real face, so strike a balance between clothes and jewellery for your bridesmaids and yourself. The ten bridesmaid jewellery suggestions you will find on the list we will show you below contains accessories that would go well with any type of dress you and your girls choose to wear on that special day. Simply gift them the accessories. This is the easiest and most creative way to make them look the way you want them to without stressing anyone. Before the big day, when all other accessories are prepared, just give them the jewelleries as a gift. You can look through this list and buy it for them, these are carefully selected from the most glamorous, yet stunning bridesmaids’ jewelry ever! 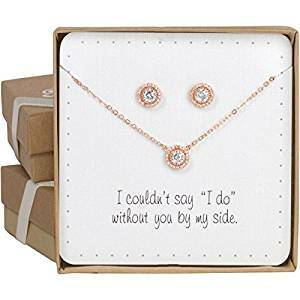 It is also a nice way to ask your very good friend to be your bridesmaid, send her a box of expensive jewelry she can use even after the wedding ceremony is over. No lady will be too busy to serve as your bridesmaid after receiving such a gift. This step four is by far the best way to plan and accessorize your bridesmaids; they wear what you want, they are happy with their gift, everyone feels special and everyone goes home happy! Here are the ten most stunning jewelleries you can pick to gift you dear bridesmaids for your wedding. They are easy to get and will not dig a big hole into your pocket since they are moderately affordable. Don’t be surprised when your friend bursts into tears of joy after receiving this set as a bridesmaid gift from you. It is so beautiful; one can hardly expect ladies not to get emotional about it. It is stunning, yet simple, and can be worn long after your wedding party is over. This classy gold plated jewelry is nickel and lead free. The precious stones use for this gift were not glued, but set with pave prong, which makes it absolutely classy and really worth the surprisingly affordable price. The chain is 45.7cm long, the lovely pendant is just 7mm in diameter, same as the earring post. Altogether, the item weighs less than one ounce, and it even comes with a gift card to soften the heart of your bridesmaid. Gold and crystal have always made a lovely combination, and this bridesmaid jewelry gift necklace set is not an exception. The matching of the earrings and necklace is nothing short of breath-taking. With the gold chain gracefully falling down to meet the pendant hanging right below the neck as the earrings smile down at it from the ears, friends would gladly postpone or cancel any engagement that would disturb them from rocking this at your wedding. So get it for your maid of honour as well as other female members of your wedding party. No matter the type of product, the thought of having a lifetime warranty is music to the ears of every buyer, no doubt. 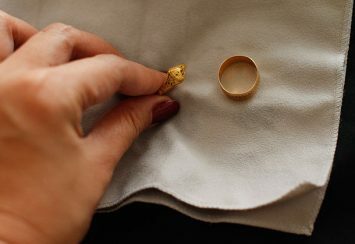 When it comes to jewelry, it is not a very common thing to see products that come with lifetime warranty, but guess what? 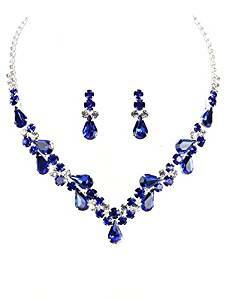 This beautiful earring and necklace set does! This bride dazzle collection is made of cubic zirconia and has a bezel type of setting. The design is unique and timeless, making your wedding a special one to remember as your bridesmaids will go back home feeling special to have worn such a beauty to stand out on that very special day of your life. The chain is made of rose gold and is nothing less than 18 inches long, both earring and pendant measure at 0.4 inches and the cubic zirconia stones used here are of the highest quality. the entire package weighs about 2.56 ounces and will greet your bridesmaid’s home or office in a special way. For more than year, this halo styled necklace and earring set has been in the jewelry market, and as you can already imagine, ladies cannot get enough of its beauty, which explains the high demand for the jeweery set. It goes with almost any kind of dress, so no matter what your bridal train will wear on that day, you can be rest assured that this precious set will complement them perfectly. 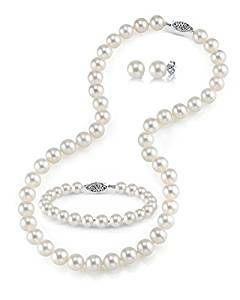 Manufactured by the pearl source, this unique wedding accessory is the perfect choice for those who want to bless their bridesmaids with gifts that can be used over and over again for different types of occasions. Surely, it will make your bridal train stun at your event, but if you guys ever need to hang out again for formal and informal gatherings, these cultured pearls will save the day. This gift item has an overall weight of 1.15 pounds, with the dimensions measuring up to 8.3 by 7.8 by 1.6 inches. As the necklace, earrings, and bracelet all fall within the range of 7 to 8 millimetres in diameter. These pearls have a high AAA quality and were handpicked specially for your wedding day and beyond. The chain is 18 inches long and the white gold has a metal stamp of 14k. Cultured pearl necklaces never disappoint at weddings, especially if you are the type of woman who likes to leave a down-to-earth impression on whatever you do. After seeing how these super classy gem stones look on your bridesmaids, you might want to buy this exact type of pearl for yourself after the wedding, that’s if you don’t use it for the big day like the bridesmaids you are shopping for. These pearls are moderately affordable, and given the multipurpose benefits they offer, you will agree with me that they are worth every dime you end up spending on them. As if all the glamour, multipurpose catch and affordability is not enough, the makers of this product offer you a 60-day money back guarantee, and the jewellery comes with an authenticity certificate. To take a break from the gold or silver dominated jewelry sets, let us look at an equally beautiful item dominated by the color blue. If you want your bridesmaids to stand out on your big day and not look like every other set of bridal trains you have seen, this affordable set should do the magic for your wedding. 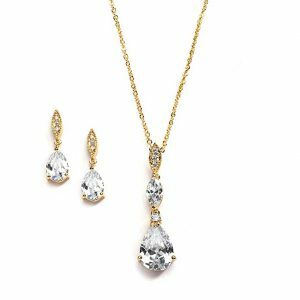 The necklace and earrings have the romantic teardrop design and will grace the necks of all your bridesmaids no matter their complexion. The necklace for this set is slightly longer than the ones we have mentioned before. This blue beauty graced with brass metal is designed with the 2 prong setting, and it will sparkle in any light, making your bridesmaids look like Angels that are ushering you into marital life. Apart from the beauty and sparkle, you should know this jewellery is rhodium plated, which means its durability is guaranteed and your friends can still rock is years after the party is over if they maintain it properly. Ladies love pink, it is the signature female colour. So express no surprise that this jewellery set is one the list of one of those that can light up your bridal tray for your wedding. The earrings and pendant are floral in style, giving that simple but rich natural look. The makers of this product have been working with those in charge of Swarovski crystals for a long time, so you can be rest assured that these crystals are as real as can be, and maintain the right level of sparkle needed to make a bridal train statement for your special occasion. 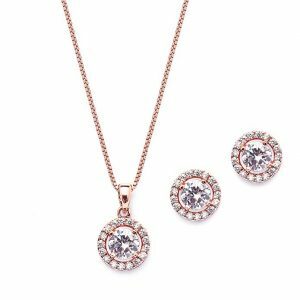 The earrings and pendant also have a rose gold feature at the top of the falling tear drop design, adding more classiness to the beautiful pieces of crystal. This stunning jewelry is made of the famous bezel setting and has a total weight of 0.32 ounces. The 18k rose gold is lead free and hypoallergenic, it has been tested to be safe for all types of skin. Also, you should know that the Swarovski crystals were fixed by hand and are totally secure, so when it is time to dance, your bridesmaids can move as much as they want without worrying if the previous stones are going to fall off. 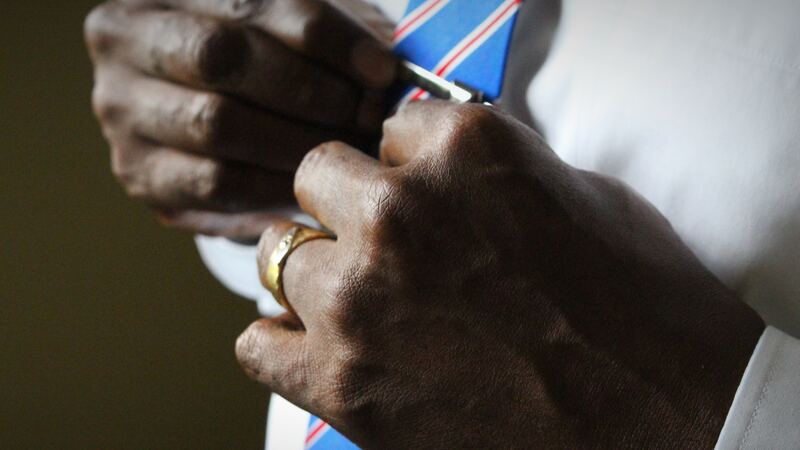 It is not just earrings and necklaces; we also can spice things up with cute bracelets on your wedding day. 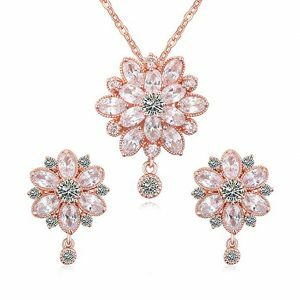 These flower teardrop jewellery set is a product of mecresh designs, and has been in the jewellery market for a little over two years. Since it was launched, ladies all over the world have used it for almost every type of occasion, especially weddings and romantic evening parties. The gem type used is Austrian crystal and metal stamp is platinum plated. With the silver plated base and overall weight of 3.2 ounces, your bridesmaids will enjoy maximum comfort on their wrists and arms throughout the ceremony and many years after. The earrings are 1.9 inches long and 0.7 inches wide, while the bracelet is 9 inches long. If your bridesmaids are going to be wearing clothes that will cover their neck, that means a necklace will not really be visible, so the bracelets on this gift package will do a lot of good. Also, if your bridesmaids are going to wear clothes that reveal their neck but have hairstyles that will cover the most part of it, the same issue of necklaces will come up, so you can take the attention from the neck to the wrists and have them wear sleeveless gowns so they can flaunt the beautiful gift you got them. After the wedding, your girls can use this set for any type of dressing. 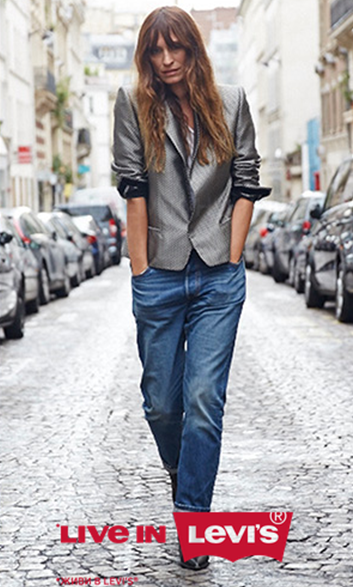 If they like to rock denim, it will go as well as when they are in an official setting. As the name implies, this stunning set of pear shaped jewelry was made specifically for bridesmaids. It has been the choice of classy brides all over the world and you too can join them if you love this amazing look on your bridal train. The yellow gold does maximum justice to the entire accessory, as it gently covers the chain length of 18 inches and gracefully falls down the neck to meet the pear shaped cubic zirconia gem type at the base of the neck. This product is up to 14 stones and weighs just 0.32 ounces. You get a lifetime warranty when you buy this gift pack, so your girls have security for the precious gift you bought for them. They can use it long enough to remind themselves of the memorable wedding and how much fun they had during their priceless moments as your bridesmaids. The brilliant gems used to make this show stopping set is of the highest quality, AAAA cubic zirconia. The earrings posts have very comfortable disks backs and they can be worn without any irritation on your bridesmaids’ ear piercing, so it is prefect for you the occasion. If you are bothered about your purse, don’t worry, this 14k gold plated jewellery set is not going to cost you so much money. It is very affordable…you would be delighted to buy and package to surprise your best friends and sisters. 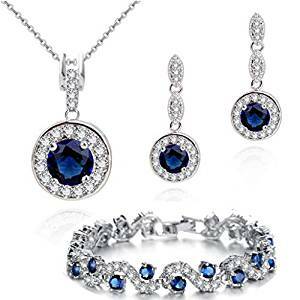 When you look at the cost of this luxury set of silver earring and necklace set, you could be quick to ask why it is on the high side, but when you open it and see the beauty and high quality of the product, your questions will be answered. 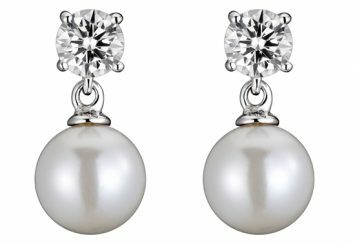 This product of HinsonGayle Fine Pearl Jewellery is pure joy to the eyes, especially for women who are particular about a natural look on their wedding day. The pearls used to make the necklace and earrings were chosen because of their high quality, silver nature and near-round shape. If you are planning to have your girls wear hairstyles or gowns that will leave their necks wide open, the pearls will look perfect on of them…giving out a rich and fertile look. Weighing 15.2 ounces, coupled with an impressive length of 18 inches, this highly sought after jewellery set will be comfortable on all shapes and sizes of women chosen to spice up your marital ceremony. You will love the strung setting used to style it, and your girls will be able to still rock this simple but classy set of earrings separately or with the necklace for any occasion at all. Roses never disappoint when it comes to jewelleries, and these sparling crystals from Swarovski do justice to that statement. The design of these earrings are modern, the pendants also have the same eye catching qualities and what’s going to really fascinate you here is the affordability of this gift item. 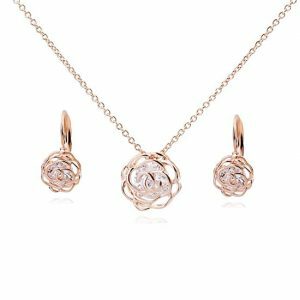 The chain and rose design of both earrings and pendant are gold plated, to make it even more charming, the color used is pure rose gold. No matter the jewelry collection of the ladies you chose to make up your bridal train, this set of irresistible jewelry will be a big addition to her wardrobe. The color inside the rose is white crystal, and this just gives it a good blend, no wonder women have been madly in love with this product of the Crystalline Line. It has been around since the last quarter of 2016 and still tops the list of jewelleries you should use for your bridal train. It weighs 0.8 ounces, the 45cm long, the earrings are both 18.35mm while the pendant is 18.18mm. 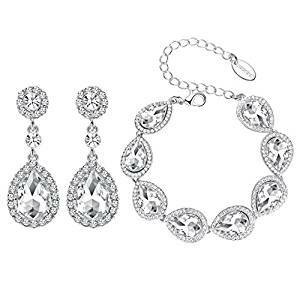 We have been looking at jewelry sets of earrings and necklaces or earrings and bracelets throughout the last nine bridesmaid sets, but this is the only one that has the entire package of bracelet, necklace and earrings. If you want your day to be flashy and are not a fan of simple accessories, go ahead and spoil your friends with this gift as you watch them sparkle at your wedding. Blue and white will always be a wonderful combination, and since you are going to be using this gift to adorn their wrists, necks sand ears, your bridesmaids need to have a complementing dress to go with this set. Their hairstyles should leave a lot of room around the neck to really show off the elegance of this stunning jewellery you got them. Chain of the necklace is 45cm long, the earrings are 14mm, pendant is 25mm, and the bracelet is 17cm long. The white gold surrounding the blue gems are nothing short of perfect, and even though it looks like a lot of accessories for your bridesmaids to wear at a go, it will not come out as flashy because the class this jewellery oozes. Despite being the entire package, you will find this gift incredibly affordable. This means your friends can get a gift of necklace, bracelet and earrings from you without having to break the bank!